Definition at line 44 of file llvocache.h. Definition at line 42 of file llvocache.cpp. References LLDataPackerBinaryBuffer::assignBuffer(), LLDataPackerBinaryBuffer::getBufferSize(), mBuffer, mCRC, mCRCChangeCount, mDP, mDupeCount, mHitCount, and mLocalID. Definition at line 75 of file llvocache.cpp. References LLDataPackerBinaryBuffer::assignBuffer(), checkedRead(), llendl, llwarns, mBuffer, mCRC, mCRCChangeCount, mDP, mDupeCount, mHitCount, mLocalID, NULL, S32, and size. Definition at line 54 of file llvocache.cpp. References LLDataPackerBinaryBuffer::assignBuffer(), mBuffer, mCRC, mCRCChangeCount, mDP, mDupeCount, mHitCount, mLocalID, and NULL. 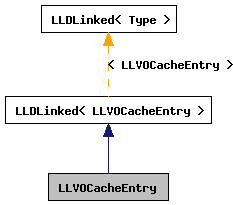 Definition at line 104 of file llvocache.cpp. Definition at line 111 of file llvocache.cpp. References LLDataPackerBinaryBuffer::assignBuffer(), LLDataPackerBinaryBuffer::freeBuffer(), LLDataPackerBinaryBuffer::getBufferSize(), mBuffer, mCRC, mCRCChangeCount, mDP, and mHitCount. Definition at line 146 of file llvocache.cpp. References llendl, llinfos, mCRC, mCRCChangeCount, mDupeCount, mHitCount, and mLocalID. Definition at line 53 of file llvocache.h. Referenced by LLViewerRegion::cacheFullUpdate(), and LLViewerRegion::getDP(). Definition at line 55 of file llvocache.h. Definition at line 127 of file llvocache.cpp. References LLDataPackerBinaryBuffer::getBufferSize(), mCRC, mDP, mHitCount, and NULL. Definition at line 54 of file llvocache.h. Definition at line 52 of file llvocache.h. 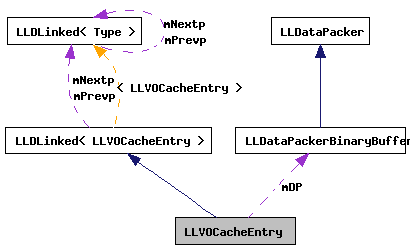 Referenced by LLViewerRegion::cacheFullUpdate(), and LLViewerRegion::loadCache(). Definition at line 62 of file llvocache.h. Definition at line 140 of file llvocache.cpp. Definition at line 164 of file llvocache.cpp. References checkedWrite(), LLDataPackerBinaryBuffer::getBufferSize(), mBuffer, mCRC, mCRCChangeCount, mDP, mDupeCount, mHitCount, mLocalID, S32, and size. Definition at line 71 of file llvocache.h. Referenced by assignCRC(), LLVOCacheEntry(), writeToFile(), and ~LLVOCacheEntry(). Definition at line 66 of file llvocache.h. Referenced by assignCRC(), dump(), getCRC(), getDP(), LLVOCacheEntry(), and writeToFile(). Definition at line 69 of file llvocache.h. Referenced by assignCRC(), dump(), getCRCChangeCount(), LLVOCacheEntry(), and writeToFile(). Definition at line 70 of file llvocache.h. Referenced by assignCRC(), getDP(), LLVOCacheEntry(), and writeToFile(). Definition at line 68 of file llvocache.h. Referenced by dump(), LLVOCacheEntry(), recordDupe(), and writeToFile(). Definition at line 67 of file llvocache.h. Referenced by assignCRC(), dump(), getDP(), getHitCount(), LLVOCacheEntry(), recordHit(), and writeToFile(). Definition at line 65 of file llvocache.h. Referenced by dump(), getLocalID(), LLVOCacheEntry(), and writeToFile().